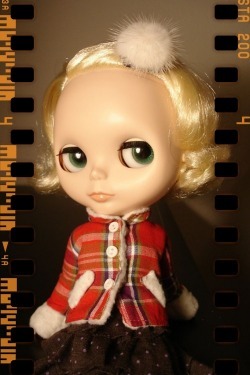 Steren was my first Takara Blythe, pre-ordered based on promo illustration only. The best part about her was that her price was so reasonable for my first girl, made the hobby easier to slip into :) She is the sweetest of all my girls because she was exactly what I wanted. Customizations So Far: All eye chips replaced, face sand-matted, gaze correction. About Her: She's a shy, bright eyed Cornish pixie, Steren translating to star. She quiet and speaks with her eyes and enjoys watching people.